Unfortunately, most people at some time or another encounter a stubborn stain that just won't come out. Even linoleum--which tends to be easy to clean--can experience difficult stains. 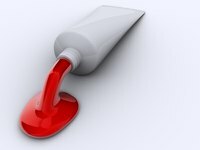 Should you get red dye (whether hair dye, ink dye, fabric dye or other type) directly onto your linoleum, you may find that it will take more than your typical floor cleaner to remove the stain. Luckily, there are some common household products that will get that stain out permanently. Remove the stain with bleach. Pour bleach directly onto the stain, allowing it to set for 30 minutes. Wipe the bleach off of the floor using a clean cloth. Bleach is safe to use on linoleum flooring and is great for getting out stains--even red dye. Pour white vinegar over the stain. Allow the vinegar to soak into the stain for 20 to 30 minutes. After the time is up, wipe the vinegar off with a clean cloth or paper towel. Pour some nail polish remover (with acetone) onto a cotton ball. Using a little elbow grease, rub the nail polish remover into the stain. Within a few minutes the stain should be completely gone. If you do not have any nail polish remover, repeat this step using rubbing alcohol.